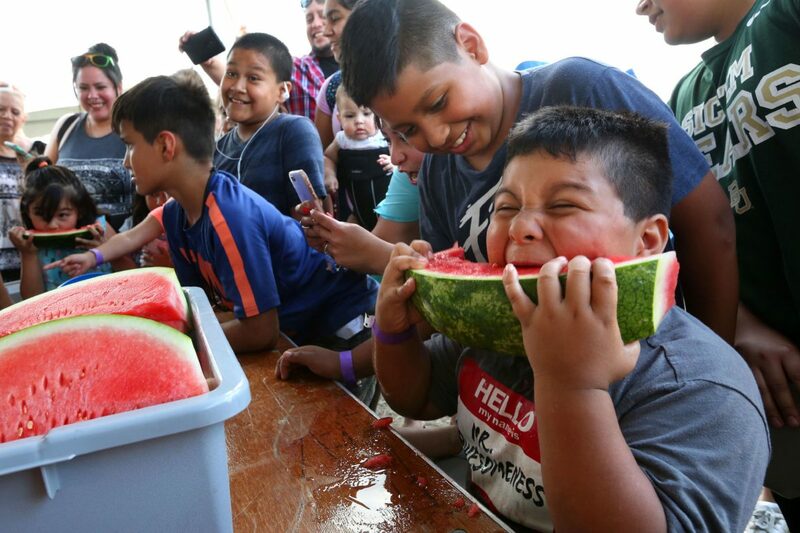 Juan Javier Garza, 7, competes in the watermelon eating contest as Nicholas Garza, 10, above, watches him at the Watermelon Festival Saturday, May 12, 2018, in Alamo. ALAMO — As the temperatures start to soar with the rapid approach of summer, it was easy to appreciate the refreshing, flavorful fruit that inspired an annual festival here. The lure of juicy watermelon, carnival rides and musical entertainment drew crowds Saturday to the 6th Annual Watermelon Festival. Held at the downtown park, the city closed off streets around the festival site, including Business Highway 83, for the event that has become increasingly popular. The festival boasts all-you-can-eat watermelon, from large to small slices, and festival-goers walked around the park, often with both hands full of fruit. Melisa Gonzalez, the city’s special projects director, said the festival keeps growing year after year. 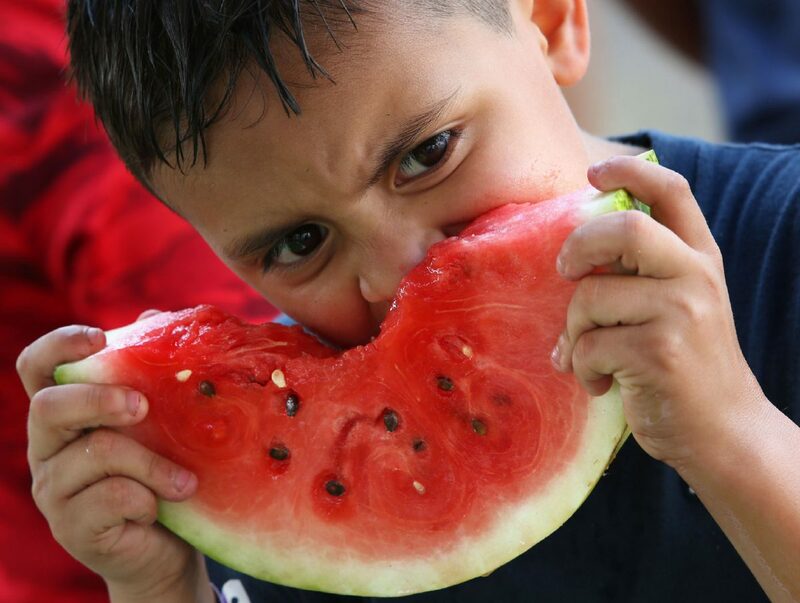 Israel Rios, 7, takes a bite of a large watermelon slice Saturday, May 12, 2018, at the Watermelon Festival in Alamo. Luis Mata cuts slices of watermelon to give out to visitors at the Watermelon Festival Saturday, May 12, 2018, in Alamo. Ernesto Solis Jr., left, points out the winner of the watermelon eating contest amongst a group of children at the Watermelon Festival Saturday, May 12, 2018, in Alamo. Being a small town where almost everyone knows each other, the festival is like a large family reunion. The community also had entertainment with a watermelon-eating, seed-spitting and archery contests, along with small carnival rides for the children. Families also spent their time enjoying the usual festival foods such as spiral potatoes and fajita tacos while listening to live music of Whiskey D, Jaime y Los Chamacos and Elida Reyna y Avante, among others. The watermelon-eating contestants were mostly children who ate a slice each in the contest with individual who ate the slice the fastest deemed the winner. 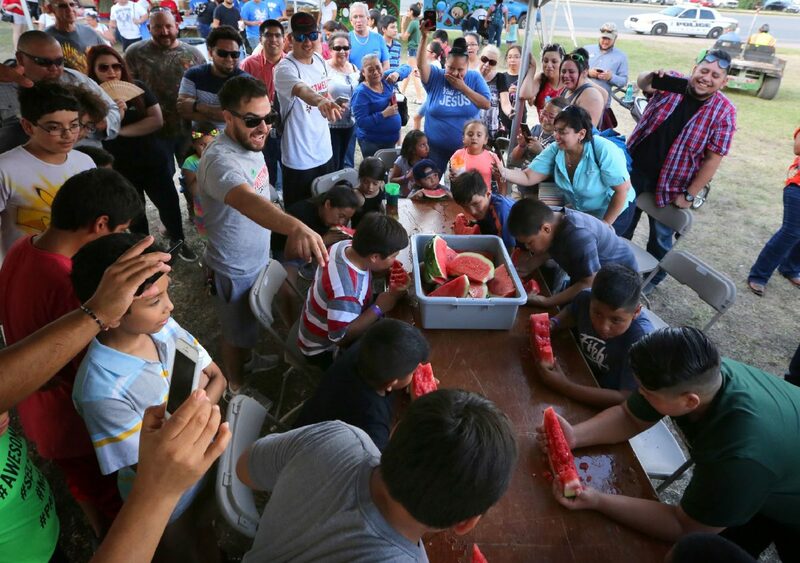 Alamo resident Dominic Sauceda won his age bracket in the watermelon-eating contest, saying it was difficult to finish the slice, but that he ate it all because he wanted to win. “I ate too much watermelon right now and earlier,” Sauceda said while holding his stomach. In another section was the watermelon patch, where volunteers from International Bank of Commerce and Lone Star National Bank were cutting and serving the watermelon slices. 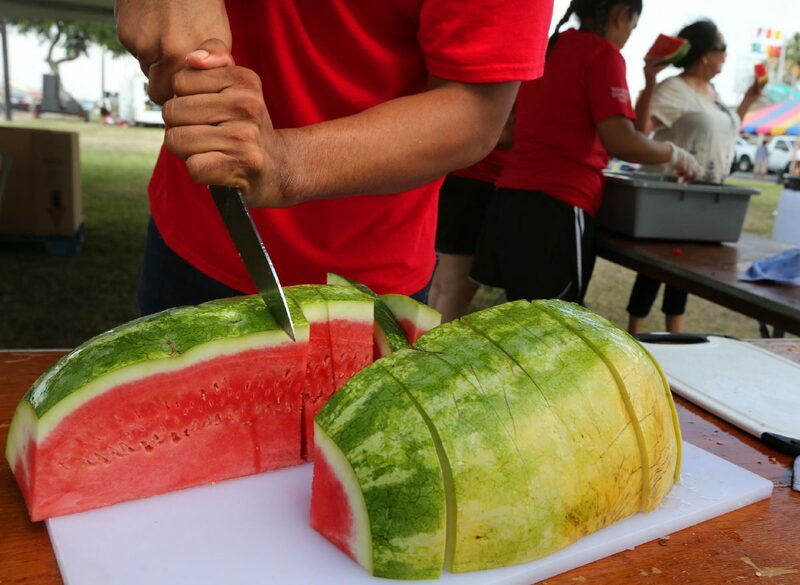 IBC volunteer Daniel Alvarez said he had cut hundreds of watermelon slices since the festival began at three in the afternoon. Behind the cutting and serving area, approximately 10 large boxes were filled to the rim with watermelon with another spot serving as an ice chest to keep them fresh and cool. Pharr resident Amy Garza, who has attended the festival for the past three years with her friend Laura and her two daughters, said they attend the festival for the fresh watermelon. “We just came to have a good time and enjoy free watermelon and listen to the bands,” Garza said. Lilly Soto, Laura’s daughter, said she had eaten four slices and keeps coming back for the watermelon every year.